England is one of our newest destinations and fast becoming one of our most popular. Spring is a wonderful time to visit, as flowers fill parks and country estates with fragrance and color. The Chelsea Flower Show, May 24-28, is one of London’s most anticipated spring events, with hundreds of gardeners exhibiting their tributes to the spirit of the season. Also in London this spring is the exhibition “International Arts and Crafts.” Sure to be a blockbuster, this survey of the Arts and Crafts Movement and its international influences will be at the Victoria & Albert Museum March 17-July 24. Another favorite London activity recommended by our travel specialists—several have spent years living in the English capital—is a guided wander through the city’s quiet backstreets, learning about local architecture and history. Not far from London, in the rolling countryside of Hampshire, is one of our favorite new places: the just-opened Four Seasons Hotel Hampshire (above), a Georgian estate with heritage-listed gardens. Spring brings baby lambs and blooming daffodils to the area. And May 1, the new spa at the Four Seasons Hampshire opens inside the brick walls of converted stables, adding to the many activities already available in the area, such as horseback riding, antiquing in local villages, picnicking along the Basingstoke Canal, and visiting local attractions such as stately homes, Stonehenge, and the city of Bath. Other fine country properties featured in our England Tours include Chewton Glen, a beautiful 18th-century manor house on 130 acres of woodlands in Hampshire, and Whatley Manor, a lovely Relais & Chateaux estate set among the hills and stone cottages of the Cotswolds, two hours from London. The latest good reason to visit Whatley Manor? “The Dining Room,” one of the hotel’s two restaurants, was awarded its first Michelin star in January. While in the Cotswolds, our travelers enjoy comprehensive touring with their own private driver and expert Blue Badge guide. A typical day features Roman ruins, private gardens, manor homes, and time in picture-perfect villages to enjoy local pubs and specialty shops. 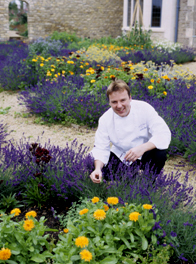 A highlight is a visit to Barnsley House for a gourmet lunch overlooking its famed English country gardens. We love Hanoi, Vietnam’s beautiful capital. It’s a place to ride in a cyclo down tree-lined streets, or sit in a cafe sipping strong coffee, sampling local snacks and watching the world go by. Hanoi is also becoming Vietnam’s new capital of style, with modern art galleries, custom furniture stores and specialty boutiques. One such shop is Song (above). 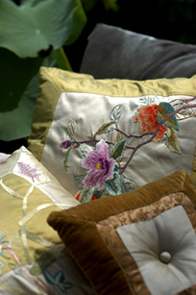 It captures the romance of Hanoi in sophisticated embroidered silk and cotton loungewear, cushions and linens. Great style and great shopping are nothing new in Hanoi. For a thousand years, artisans have occupied tiny workshops in the Old Quarter, fashioning products from tin, bamboo, paper and other materials, then stacking them into piles along the narrow streets. More recently, the French colonial-era had a major impact on the city’s architecture. 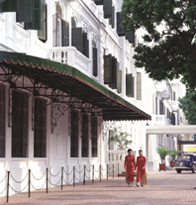 Particularly notable are the French villas lining many streets and Hanoi’s landmark hotel, the Sofitel Metropole (below), whose shuttered windows overlook a courtyard of flowers and palm trees. But “vintage” need not mean “old”—a number of villas have been converted into gourmet restaurants, and the Metropole has recently undergone a renovation. In addition to Hanoi, our luxury Vietnam Tours feature many other great destinations such as Saigon, the fast-paced commercial capital; the Mekong Delta, a vast rural area of narrow waterways, floating markets and island farms; Sapa, a mountain town surrounded by colorful hilltribe villages and markets; Hue, the former imperial capital known for royal ruins and Buddhist vegetarian cuisine; and Hoi An, a charming port town whose centuries-old temples, merchant homes and shops reflect years of international exchange. Most of our travelers also like to incorporate special activities such as cooking classes or meals in private homes into their Vietnam tour. The British considered Hong Kong a “barren rock” when they colonized it in the 19th century. Today, that “rock”—actually, lush green islands and peninsulas—is one of the most stunningly beautiful, cosmopolitan cities in Asia. Its urban landscape is a vibrant, ever-changing field of options, driven by locals who treat dining, shopping and good living as Olympic events. To help us keep up with Hong Kong’s energetic pace, we turn to one of our travel specialists, Ann-Stewart Nichols, a Hong Kong native who updates us following her regular trips home. She’s currently helping us keep an eye on two new major luxury properties due to be completed later this year: a Four Seasons Hotel situated above a high-end shopping mall, and a new Mandarin Oriental, complete with a Harvey Nichols store (the first outside the UK). Nichols has also helped add an unparalleled insider’s perspective to our private touring in her hometown. In addition to taking visitors to top sightseeing spots such as Victoria Peak and Stanley Market, we arrange a number of specialty activities rarely available to visitors. How about lunch at an atmospheric dim sum shop popular with locals or dinner at the China Club, one of the city’s most exclusive restaurants (reserved for members and their guests only). 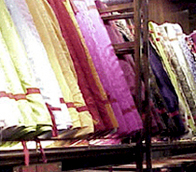 We can also arrange guided tours to shop for high quality Chinese antiques, bespoke suits and dresses (such as at Shanghai Tang, below) and custom jewelry presented in the beautifully decorated private homes of Hong Kong’s leading designers. As much as Hong Kong is a major destination in its own right, it’s also an international hub and gateway to China. Our China & Hong Kong Tours feature some of our favorite ways of combining these two very hot travel spots. While the recent tsunami seriously damaged some parts of Phuket, Thailand, most of the island paradise was virtually untouched. Thais living in the area are anxious to convey to the world that the damage was localized and that the tourist industry is fully functional throughout nearly the entire island. They are eager to welcome visitors back to Phuket because tourism is the driving force in the local economy and vital to ongoing reconstruction efforts. For its part, the Amanpuri, Phuket’s premier luxury resort, is offering savings of 50 percent off their standard rates for stays through October 31. This is an unusual opportunity to enjoy the Amanpuri’s charms: private hillside villas in traditional Thai style, a large infinity pool under tall palm trees, a private beach club, a decadent spa and more. 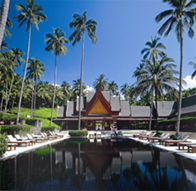 The Amanpuri is featured in our Romantic Thailand tour and can be included in any of our published Thailand Tours or custom-designed tours in Asia. The following Flan de Rouen recipe was inspired by our recent trip to Normandy. Apple blossoms and ripe cheese perfume this diverse region along the northwestern coast of France, home to Claude Monet’s garden at Giverny, the island monastery of Mont St-Michel, the cathedral of Rouen, the D-Day landing beaches, picturesque seaside villages and half-timbered houses. More and more of our travelers visiting Paris are requesting day tours to Normandy, a short drive away. See our France Tours or contact us for more information about how to incorporate Normandy into a tour. In the meantime, try this tasty apple tart with some of Normandy’s other culinary specialties: Calvados (apple brandy) and Camembert, Pont l’Eveque or Livarot cheese. Line a 10-inch springform pan with the pate brisee. Prick the shell and chill for 30 minutes. Preheat oven to 350°F. Peel and core the apples, cut into eighths and arrange them decoratively in the shell. In a large bowl, whisk the whole eggs, egg yolks, flour and sugar. Slowly add the milk to the mix and continue stirring. Pour this mixture over the apples. Bake in 350°F oven for one hour. Let cool, remove from pan, cut and serve at room temperature. Add a dollop of whipped cream, if desired. Makes six servings.